Looking for a fun, easy and inexpensive way to see more of the California coastline? Go Amtrak. 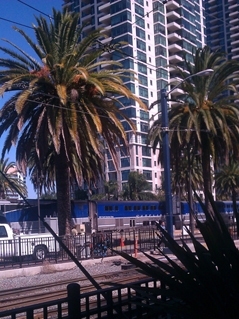 For just $23, I rode the Pacific Surfliner coach, one-way from San Diego to Irvine to visit friends. I relaxed and enjoyed the view the entire 1 hour and 35 minutes. Kids 2 through 15 years old ride half-price every day; infants under 2 ride free. The train station was just a quick 5-minute cab ride from my hotel near the San Diego Convention Center and in the heart of the Gas Lamp District. No long lines, no crowds, and both train stations were small, clean and easy to get in and out of. It was a no-brainer when my only other options were either $300+ for shuttle service to John Wayne Airport, or a one-way rental car for $100+ from San Diego International Airport to John Wayne, plus cab ride from my hotel. Taking the train saved me time, money and Advil. Granted, I was riding on a Sunday, and I hear that during the week this route gets pretty busy with commuters, but it sure beats California traffic. And sitting back admiring the coastline from the panoramic windows instead of inhaling exhaust on the crowded California freeways made it worth every penny. You can upgrade to business class for reserved seating, but I practically had the whole train car to myself in coach. There are seating areas for four or more passengers or just two, and each area has its’ own electrical outlet for plugging in your laptop, smartphone or other electronic devices, which was a pleasant surprise. Lots of legroom and foot rests were nice too. The double-decker train also has a café on the bottom level serving fresh sandwiches, snacks and beverages. And, as it is California, most Pacific Surfliners come equipped with bicycle and surfboard racks if you’re so inclined. With stops all the way from San Diego to San Luis Obispo, including Anaheim, what a cool way this would be to travel as a family between Sea World and Disneyland – stress-free! That sounds like a GREAT trip! Wow, $23? This is awesome and I’ve never heard about it! [quote name=Amber Johnson]Wow, $23? This is awesome and I’ve never heard about it! [/quote]I know! I was surprised too! We are definitely taking advantage of it next time we go back as a family. I had never thought about traveling this way — definitely on my radar now.